Multiple teams earned their first win of the season in Week 3, including one of the teams in our Game of the Week. With 30 goals scored in the third week, there was plenty of action to keep you glued to your seat. But first, let’s look at Thursday night’s match between the Tulsa Roughnecks and St. Louis FC. Both the Roughnecks and Saints came into Thursday night’s match looking for their first win. Tulsa had just come off a draw with in-state rival Oklahoma City, while St. Louis had suffered a 2-0 King’s Cup defeat to Louisville City. Though Zac Lubin tallied eight saves in the contest, it was the Saints who emerged 2-0 winners to notch their first win in club history. The Saints took it to Tulsa to begin the game, outshooting their hosts 9-3 in the first half and forcing Lubin into six saves. Though TRFC fired the opening salvos, one was blocked and the other went wide of the frame. STLFC showed much more intent with their first few shots, with a shot by Jamiel Hardware rattling the post in the 17th minute before Jermie Lynch forced Lubin into a save a minute later. After peppering the Roughnecks’ goal for most of the half, the Saints finally found the breakthrough in the 43rd minute of action. Patrick Doody whipped in a cross that eventually fell to the feet of Bryan Gaul after a back heel by the captain James Musa. Though Gaul’s shot was blocked by Tulsa’s man on the front post, Lynch collected the rebound and buried it in the back of the net. Following the interval, St. Louis wasted no time in doubling their lead. A smart pass by Lynch was slotted between Tulsa’s Laurie Bell and Ben Brewster to Gaul. All the forward had to do from there was hit it home from the top of the box. Lubin did well to get a finger to it, but was unable to push it out of the goalmouth. Tulsa thought they had pulled one back in the 60th minute courtesy of Gibson Bardsley. A chipped through ball played Bardsley in, and though his shot found the back of the net, the assistant’s flag had been raise. When Tulsa’s No. 7 brought down the ball, he was judged to have used his hand and so the goal was waived off. The Roughnecks continued to chase the game, but would be unlucky to not find a goal despite laying siege to Mark Pais’ goal for much of the second half. Pais proved equal to every question asked of him, however, en route to his first professional shutout. – The Charleston Battery dispatched the Harrisburg City Islanders 2-0 to move to 3-0-0, their best start in 12 years. Haviel Cordoves and Dane Kelly scored both scored, with Kelly subbing on for Cordoves and almost immediately notching his second goal of the season. The Islanders fell to 0-2-0 with the defeat. – The OKC Energy notched their first win of the season with a 2-1 last-gasp victory over first-year side Colorado Springs Switchbacks FC. Dani Konig bagged a brace in the win, including a 93rd minute winner to ruin Colorado Springs’ inaugural home game. Mike Seth scored the first goal in Switchbacks’ history. – New York Red Bull II capitalized on their 11 players loaned by parent club New York Red Bulls to route Toronto FC II 4-1 to earn their first victory of the season. Sean McLaws, Leo Stolz, Marius Obekop and Anatole Abang all opened their accounts with NYRB II, while TFC II got on the board via an own goal. – A week after winning 5-2, the Pittsburgh Riverhounds fell 2-1 to the Rochester Rhinos at Highmark Stadium. Tony Walls opened the scoring with a goal off a dead ball situation before Max Touloute drew Pittsburgh level soon after the restart. Alex Dixon immediately provided the answer after getting on the end of a cross from Kenardo Forbes. Kris Tyrpak had a great goal in Austin’s second game of the week against Tulsa. A left-footed knuckling shot from 20 yards out at the corner of the box rocketed past Lubin and into the back of the net for Tyrpak’s second goal of the game. New York Red Bulls-loanee and academy product Sean Davis provided an excellent chipped through ball that was weighted perfectly for Abang to open the scoring. Not only did he leave the ball with just enough room for Abang to get onto it in the six-yard box, but he had a tidy tackle in the attacking third that immediately led to the goal. Pais robbed Bardsley and there is no other way to put it. Bardsley found himself through on goal after collecting the ball off an awkward bounce and was in a one-on-one opportunity. However, a last ditch kick save by Pais kept the ball out of the net, even if it did fall to the feet of Brady Ballew. Pais was equal to Ballew’s effort from outside the box though. 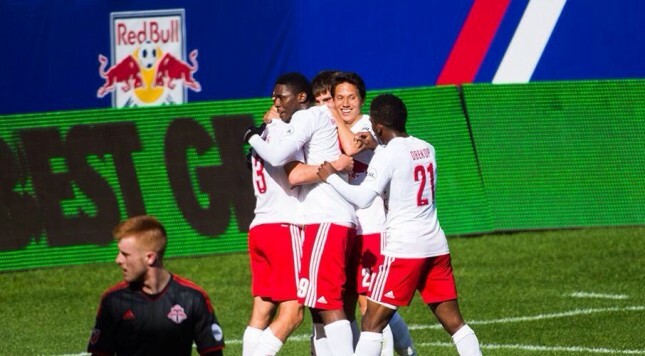 – A lot of people are upset about NYRB II’s use of 11 loan players in their win against TFC II. Granted, they were one day loans, but given that it was all in-house, I don’t think there is a whole lot the league can do. We’ll see what happens from here. – USL CEO Alec Papadakis now sits on the United States Soccer Federation Board of Directors as reported by Ted Westervelt and confirmed by Jeff Carlisle. That should help out when trying to move into Division 2 shortly. Papadakis replaced Merritt Paulson on the board. – Four teams are still searching for their first point of the year, and an additional six are still looking for their first win of the season. Most surprising of that group is LA Galaxy II who has yet to win a game despite playing three so far. – Portland and Seattle are really enjoying their return to the USL. They’ve combined to go 4-0-0 with 13 goals scored so far this season. – After watching the highlights of Tulsa’s second game against the Aztex, I would just like to make mention that Tulsa is probably in the running for most unlucky team at this point. They’ve had some really good, quality strikes at the goal met by some great reaction saves by the three keepers they’ve faced, not to mention blocked shots by defenders and untimely offside calls. – My favorite part of this week’s game of the week was the first 15 minutes of the game when the announcers kept referring to Adam Black as Steven Miller. I realize their jerseys numbers are one digit apart, but it’s the little things in life.